When the race for the US Presidency began, no one envisioned that Republicans would head to their convention in Cleveland in July, to put their stamp of approval on a billionaire TV reality star. From the start of his campaign, Donald J. Trump has built on theatrics, tough talk, sentimental (and largely erratic) outbursts, and a fierce demonizing of all foes. Like no other Republican (or even Democrat) before him, he has made very strong statements that should ordinarily turn the electorate against a candidate for the Presidency. Mexicans and Latinas, African Americans, entire nations and leaders of nations, no demographic has been safe from his wrath. He has been described as a bully with a very thin skin, a misogynist, a selfish elite, a fraud, a draft dodger etc. Even within his own party, he has faced criticism even from notable Republican leaders, but none of that seemed to have fazed him or even slowed him down �not until the Democrats headed to Philadelphia and a gold star family took to the stage on the last day of the convention. The Khan's lost a son in Iraq. Captain Humayun Khan, a member of the US Army, was killed on active duty in 2004. 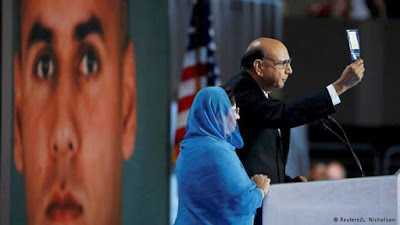 His parents- Khizr and Ghazala Khan- were at the DNC, where Mr. Khan heavily criticized the Republican Nomine's understanding of the constitution. He stated that under Trump's proposed policies, someone like his son (the late Capt. Humayun) would not have been allowed into the USA. In typical Trump fashion, the Republican mogul launched into a twitter rant against the Khan's; and in a TV interview, went as far as insinuating that Ghazala Khan simply stood on the stage speechless, because of her Muslim faith! And it was this particular not-very-well-though-through response from Trump, which seemed to have signified the beginning of the end for him. Now, anyone interested in getting involved in US politics knows that there are certain cardinal rules one must obey- especially during an election season- and one very important rule is that a candidate never goes after a gold star family! Americans have the utmost regard for their men and women in uniform not to talk of those who have paid the ultimate sacrifice in defense of their nation. So, how dare Trump- a man who basically evaded being drafted into the Army, due to his societal status; a man who knows nothing about combat and sacrifice; a man whose entire existence has been lived in the laps of luxury- go after a family whose son gave his life in defense of the star-sprangled banner? Even Republicans did not find it funny. And one by one, they issued statements denouncing Trump's outbursts against the Khans. From Senator John McCain, House Speaker Paul Ryan, Senator Lindsey Graham, Senator Chuck Grassley etc., the rebuttal was swift and strong. The American media also went in...and they were savage. Now, the really funny thing about the US media during an electoral season is the fact that they are notorious for hitting candidates the hardest, when they are at their lowest. So, Trump, who was once the darling of the media during the primaries season, found himself increasingly subject to their attacks and scrutiny as he ventured into the general elections arena; especially as he has continued to make one blunder after another. One would think that at this point, the Republican Nominee would be more measured in his tone more Presidential in his outlook �more diplomatic and logical with his reactions and responses but no, not Trump. He just never seems to learn! And with the recent overhaul- again- of his campaign team, his performance is only bound to continue on its outrageous trajectory. Even a recent expression of regret over certain past actions was so unspecific, that it came off as being totally insincere...vintage Trump! One of Trump's greatest flaw is his legendary narcissism, he seems to view himself as being better than everyone else and beyond reproach. Fareed Zakaria was not wrong when he called him (Trump) a B.S artist one who doesn;t hold himself accountable to the laws of lies or truth, but simply makes up his own universe as he goes along. But in this moment, Trump seems to have hit a brick wall...one which no 'Brietbart strategist' can save him from! The Khans became his waterloo, and it has been hard to rise again after disrespecting them that way. The Donald has continued to witness a slide in the ratings, and the Clinton camp has only been too glad to watch his tumble. A simple apology may have remedied the situation; but Trump wouldn't have been Trump if he offered one and so he didn and like Superman's Kryptonite, the Republican candidate has only gotten weaker since that tragic day when he decided to go after one part of America's sacred clan- a gold star family.